We characterise the properties of unstably stratified homogeneous turbulence by means of high-resolution direct numerical simulations and a two-point statistical spectral model based on a quasi-normal closure proposed by Burlot et al. Both approaches agree very well regarding the evolution of one- and two-point turbulent statistics, showing that the model is valid at even higher Reynolds numbers than previously considered. From a parametric study with different initial conditions, we confirm that the energy distribution at large scale influences strongly the late time dynamics of the flow. In particular, we assess the existence of backscatter transfer of energy, and evaluate its role in the growth rate of several turbulent quantities. 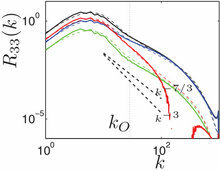 Moreover, thanks to the statistical model, we analyse the scale-by-scale anisotropy of the flow through the decomposition of turbulent spectra in terms of directional anisotropy and polarisation anisotropy, for a refined characterisation of the structure of the flow which is strongly anisotropic in the large scales. This also allows us to study how isotropy is restored in the inertial scales.